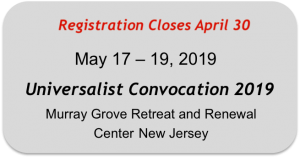 The Universalist Convocations began in October 1990 with the convening of the initial convocation in Shelter Neck, North Carolina. Over 100 people from 13 states gathered together, fulfilling the mission of the Universalism Convocation. The mission of Universalist Convocations is to gather Unitarian Universalists together to learn about, celebrate, and draw from the heritage of Universalist faith and experience to the end that this heritage shall inform Unitarian Universalism today and help to light its way toward the future. The Universalist Convocations is organized exclusively for educational, religious and charitable purposes within the meaning of the Internal Revenue Code. Universalists have been meeting yearly since the first convocation at Shelter Neck. All are welcomed. Attending a Universalist Convocation is a perfect opportunity to learn the rich history of the other U in our UU faith tradition.